Happy New Year & My Favorite Fashion Moments from 2011!! So excited to write my first blog post of 2012! I hope everyone had a wonderful New Year’s Eve! I went to Knoxville to go out with my college roomie & friends. I had a great time & I thought I would show you a few snapshots of my evening & OOTN! I had a hard time deciding what to wear but ultimately went for my black lace dress because it wasn’t TOO dressy for dinner and dancing. Pictured with my beautiful college roomie...both of our dresses are from Forever 21! We danced the night away as we rang in the new year! 2011 was the year for 2 great designer collaborations: Missoni for Target and Versace for H&M. My very first blog post was on the Missoni for Target line (read HERE), so I guess you could say this topic holds a very close spot to my heart! Missoni for Target created mass chaos among fashiongurus everywhere. On September 13th, the day the line launched, Target.com crashed multiple times from the overload of traffic and the Missoni line sold out the day it launched in most stores. Versace for H&M was another great designer collaboration of 2011. Similar to Missoni for Target, the release of Versace for H&M also created mass pandemonium, and not just in the US. The launch of the line caused H&M’s website in the UK to crash and it SOLD OUT in Beijing and Dubai in a mere 30 minutes (according to THIS article). I unfortunately didn’t make my way to Atlanta in time to buy anything from this line but they had some pretty fabulous things. I can't wait to see what designer collaborations are in store for 2012! This sequined Tom Ford gown is gorgeous! Love this Monique Lhuillier gown on Mandy Moore at the Oscar's! 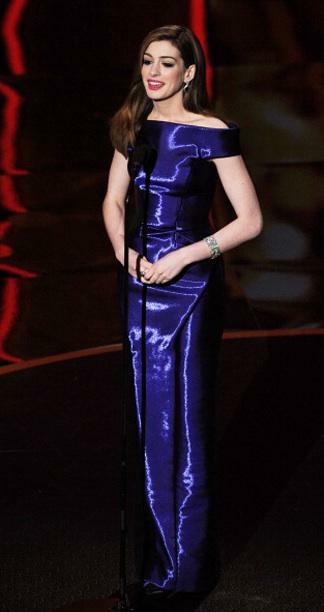 Love this navy blue sparkly L'Wren Scott dress Amy Adams wore to the Oscars! Of course the best fashion moment of 2011 was the royal wedding. I was one of those girls who woke up at 4 am to catch all the royal wedding coverage. Kate Middleton (or more appropriatelyCathereine, Duchess of Cambridge) was absolutely the most BEAUTIFUL bride I’ve ever seen. After much speculation on who would design her gown, Sarah Burton for the fashionhouse Alexander McQueen designed Kate’s STUNNING lace gown. She was the most beautiful bride! Although Kate was marrying into the royal family and her wedding was going to be watched by millions worldwide, she did her OWN makeup on her wedding day. How amazing! She was the picture of perfection. The royal wedding was also a major fashion moment because of Kate's younger sister, Pippa Middleton who graced the world with her presence. She entered the wedding in an ivory Alexander McQueen dress…and suddenly she became an overnight fashion sensation! Pippa Middleton at the royal wedding also looked incredibly beautiful! So what are your favorite fashion moments of 2011?? Leave me a comment and let me know!! Thank you very much for reading!! I can't wait to see what 2012 has in store in the world of fashion and beauty and I'm excited to post all about it!!! OOTDs: My Favorite Winter Essentials! How I Like to "Arm Party"!